How strange it is that I never felt grandiose enough to make a judgement as to whether those couples had the human right to be together or not. Doesn’t that just sound absurd? Anyway, in honor of Pride, here are some rainbow themed ideas that are delicious, silly, wacky… dare I even say creative. Happy Pride! So pretty, delicate and delicious, rainbow macarons are a delight to open and a special treat to enjoy. Who knew they made rainbow roses? Festive and very technicolor dreamcoat meets parfumerie. 80s throw back time! 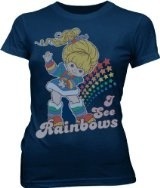 This Rainbow Brite tshirt is very cute (as is this one (see lead image), although its less 80s inspired). 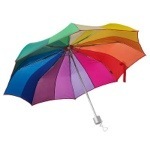 Even though it’s raining, you can have a rainbow always above you with this umbrella protecting you against rain, sleet and snow. Keep track of what day it is with these colorful undies for women or these for little kids. 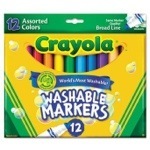 Let your inner artist express themselves with crayons, markers, paint palates and colored pencils.